As I have occasionally mentioned, I am a geek of the age where my engeekening coincided with the rise of pencil & paper RPGs, so a good chunk of my formative years were spent compulsively reading, re-reading, and memorizing the many rule books for games like Dungeons & Dragons, Gamma World, Traveler… and, of course, Car Wars. Even so, the real fun of the game came from designing an endless assortment of impressively-weaponized death wagons, keeping at all times within space, weight, and cost budgets. 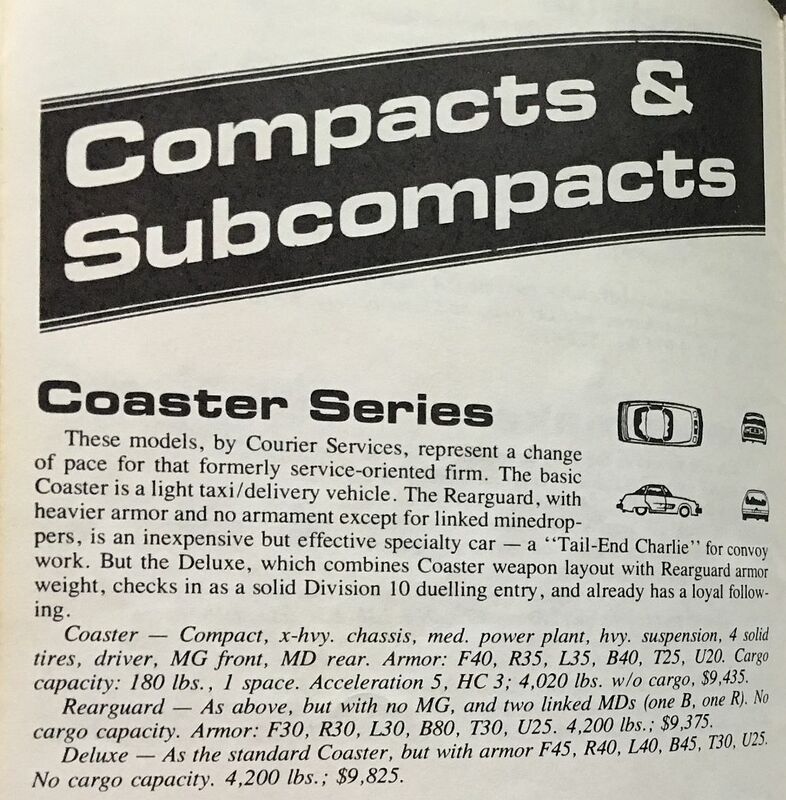 They did publish source books with sample cars, of course, such as this one below, but that was always a little dull compared to making your own. As an aside, Car Wars made me ridiculously good at math for my age range. I credit it with a lot of the advanced classes I got shoved into as a youth. Anyway, part of the shtick of Car Wars was that it was always set 50 years in the future. 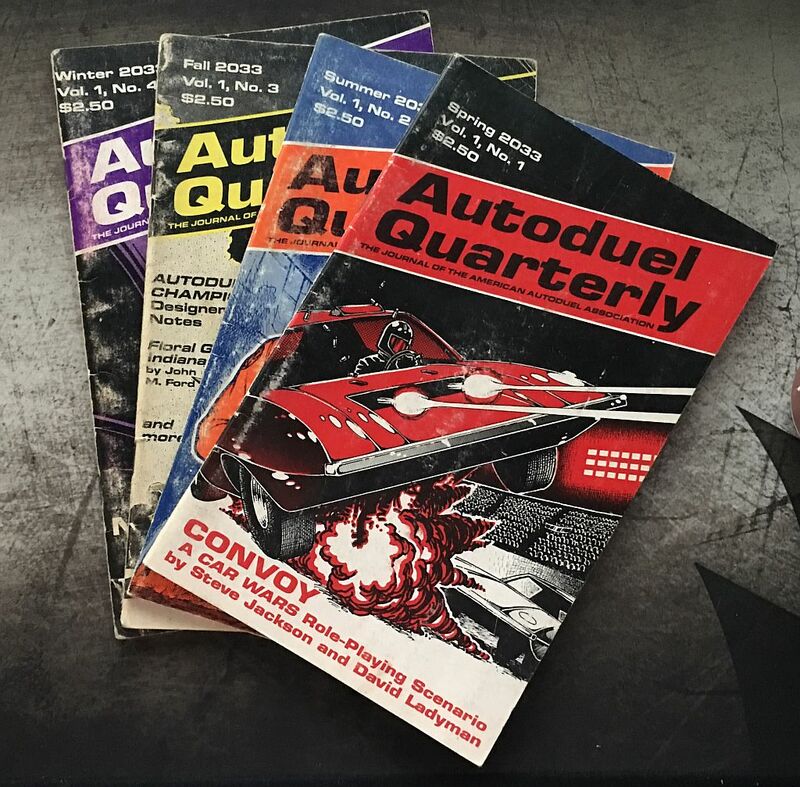 So, for example, they published a Car Wars calendar in 1988 that was labeled “2038”, and they published a magazine – Autoduel Quarterly – whose cover dates were always likewise a half-century ahead. I own about six years’ worth of the magazine, so I can probably track the rough point where I stopped being super into RPGs by when I stopped buying it. I have been on a bit of a scanning binge this year, as I’ve been converting papers and comic books and magazines into PDF files, and I finally dug my old ADQs out of a box in preparation for scanning. Then I looked at the covers, and got socked in the gut by just how many years it’s been. We’re 15 years away from actually catching up to these. Barring any health issues, I am likely to pass these fictional future dates by. This is a heck of a depressing thought for a Sunday evening. This entry was posted in organization, random. Bookmark the permalink. Hey, there’s still 15 years yet. Flamethrowers could still happen. Would make the daily commute more interesting for sure.